Preheat the oven to 180°C/350°F. Line a baking sheet with parchment paper, or grease it well and dust with flour. Set aside. Peel the apples, core, and cut into quarters. Cut the apple quarters into slightly thinner slices, then mix in a large bowl with lemon juice to avoid browning. Set aside. In a large mixing bowl, mix butter, sugar, and salt and beat until light and fluffy in consistency. Add the eggs, one at a time, and beat to combine. Add the vanilla extract and stir. Mix flour with starch and baking powder and add to mixture along with milk and stir briefly. 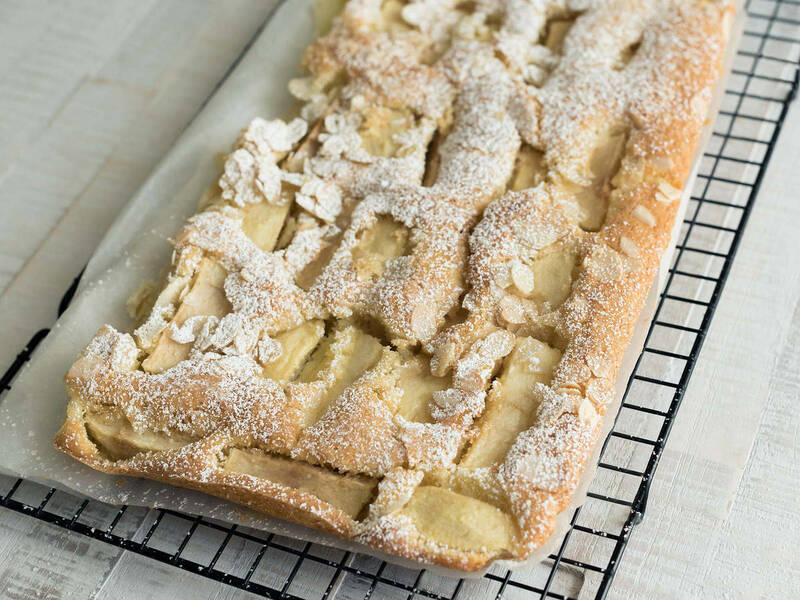 Spread the batter evenly over the prepared baking sheet, distribute apples on top, and sprinkle with almond flakes. Transfer to oven and bake for approx. 35 min. at 180°C/350°F, or until light golden brown. Remove from oven and allow to cool. Sprinkle with powdered sugar. Enjoy!